Hi! 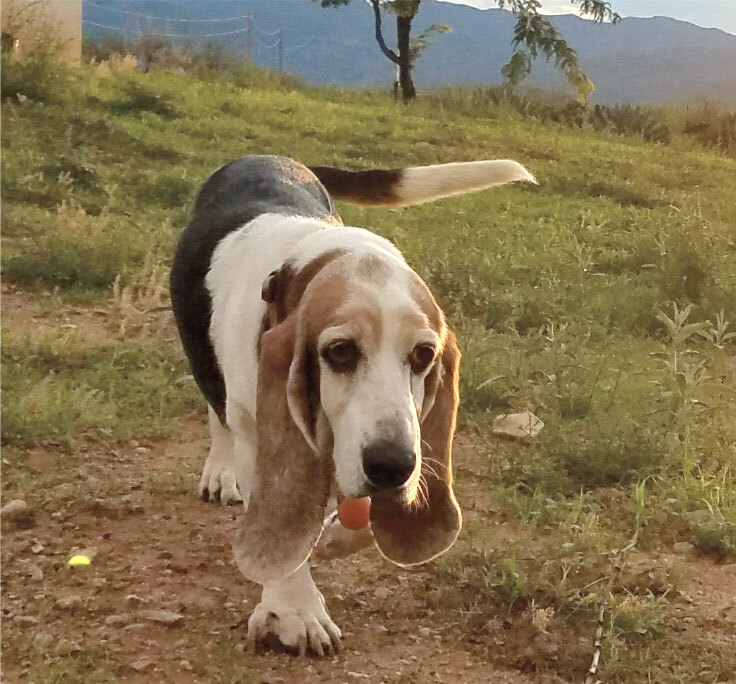 I’m Leelou, I’m a sassy Bassett Hound and I joined this pack in October 2018. I LOVE my brothers and constantly insist they play with me. I love to run, bark, play with toys and I love to cuddle. I was destined to be a vineyard dog! I think I’ll get to join my sister on the Pretty Girl label to be Pretty Girls. 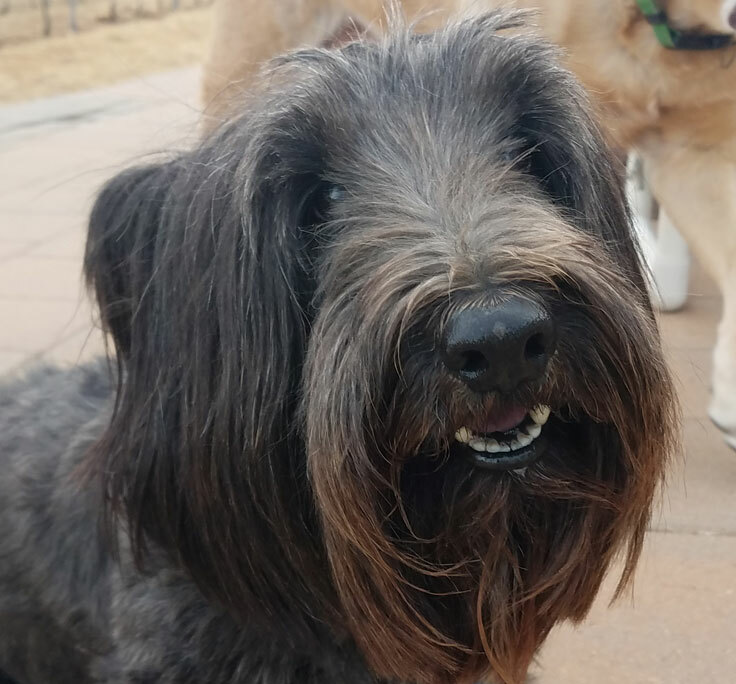 I’m a Skye Terrier and they call me Dash and I think I’m in charge of everyone here. I have many different looks … sometimes I have long hair and sometimes I get a shave down, which I really like. My favorite time at the vineyard is hanging out by the fire and chillin’. The Short Temper Tempranillo is named for me, although, I don’t know why they would choose that name for me. I don’t have a temper at all … as long as everyone does what I say. We are Bruno and Bubby and we do everything together. 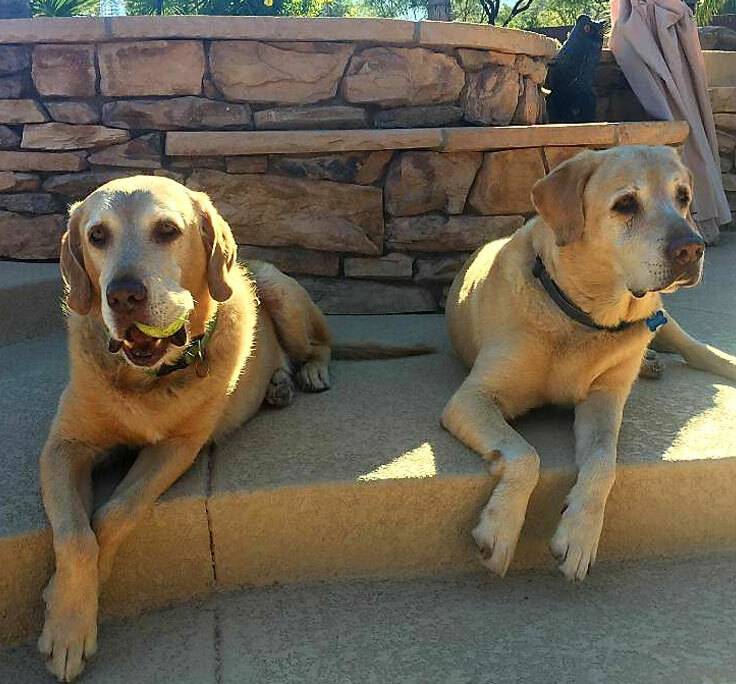 We were together for the first 2 years of our lives and then turned into a lab rescue where Mom and Dad fostered me, Bruno, but I was a foster failure (thank goodness) and they kept me. Two years later, I (Bubby) came back the rescue and Mom and Dad just knew they had to adopt me so that I could be with my brother again. We love being together and are always looking to see where Mom and Dad are because we want to be as close to them as possible. At all times. For all of these reasons, the Double Trouble Cabernet Sauvignon was named just for us! I’m Angus and I was the original “tail” of Four Tails. 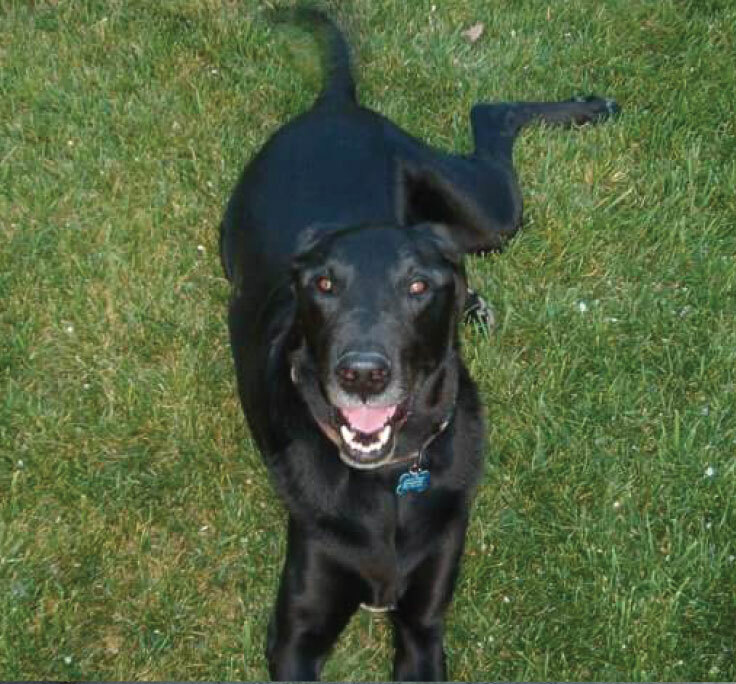 My Mom and Dad had me for over 12 years before I went over the rainbow bridge. I would have loved the vineyard and definitely would have been the perfect vineyard dog. I always loved to protect our home, make paths all around to make sure it was all secure for my Mom and Dad. Since I was the original tail, I am on the first bottle, Big Paw Syrah. You see, I had some pretty big paws and ended up being much taller than my Mom and Dad thought I would be. I’m watching over everyone and just love seeing everyone so happy. 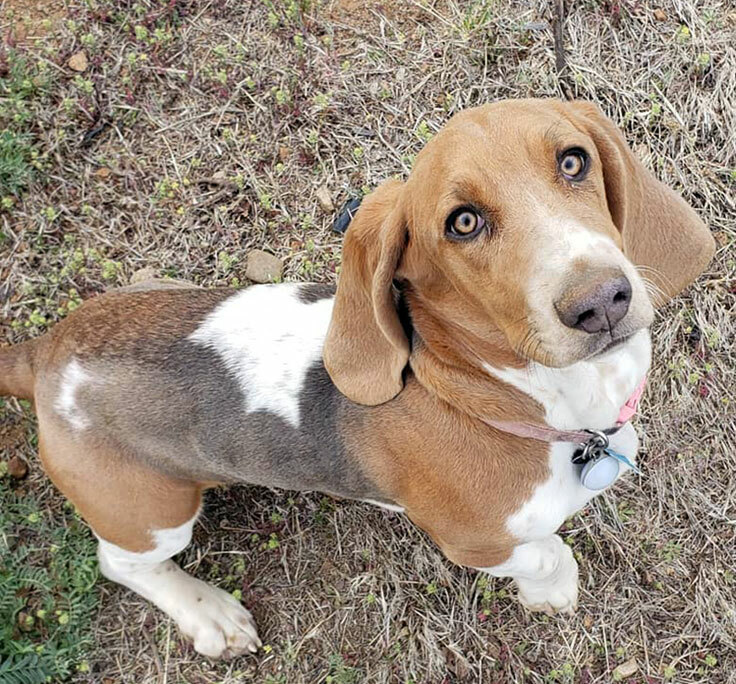 I’m a Bassett Hound and my name is Bono, although, they tell me my real name is Bonita because I’m a pretty girl. In August 2018, I joined my very best friend, Angus, over the Rainbow Bridge. I loved the vineyard and the time we spent there. Now I’ll be running and playing with Angus and watching over everyone. The Pretty Girl Viognier is named just for me.